There is a new interesting paper from CDMS that excludes an important region of the parameter space of dark matter models. First, a short summary of previous episodes. Earlier this year CoGeNT made a claim of possible detection of dark matter. CoGeNT is a relatively small dark matter experiment using a germanium detector located in the Soudan mine. The spectrum of events they registered during the first months of operation is consistent with scattering of dark matter particles with the mass of order 10 GeV and the cross section on nucleons of order 10^-40cm2. Dark matter in this mass ballpark could also fit 1) the long-standing DAMA modulation signal, 2) the 2 events observed by CDMS last year, and 3) the oxygen band excess reported by the CRESST experiment. These developments came somewhat unexpected to most of us, as the dominant theoretical prejudice would place dark matter at a somewhat heavier scale, 100 GeV or so. 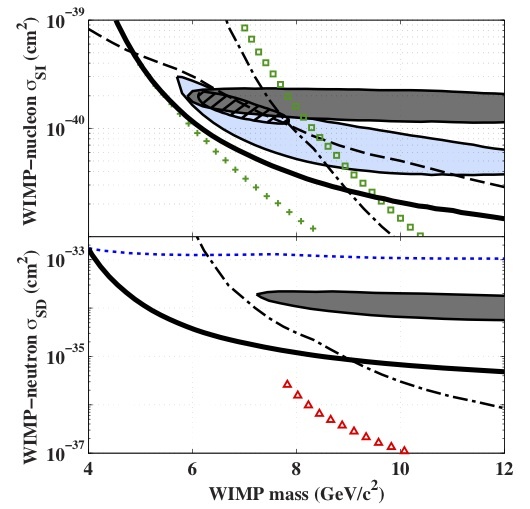 Following this prejudice, the majority of dark matter experiments were optimizing their search strategies for the weak scale dark matter, neglecting the light mass region. The typical recoil resulting from a 10 GeV particle scattering in a detector would be too small to pass the threshold set by most experiments. 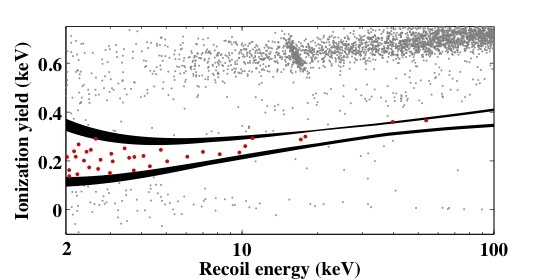 The advantage of CoGeNT is a very low energy threshold, 0.4 keV in ionization energy translating to about 2 keV true recoil energy. This is the key reason why they could achieve a better sensitivity for light dark matter than the big guys in the detection business such as the CDMS and Xenon collaborations whose analysis threshold had been higher. Nevertheless, the big guys didn't despair, but have worked toward improving sensitivity in the CoGeNT region. First came Xenon100. Using their early data they were able exclude the region of the parameter space consistent with the CoGeNT signal. The precise extent of their exclusion region is however controversial, because it strongly depends on poorly measured scintillation efficiency in xenon at low recoil energies, the so-called Leff parameter. Using more conservative assumptions about Leff, some of the CoGeNT parameter space remains allowed. Furthermore, the limits on light dark matter critically depend on certain unknown properties of dark matter, such as its velocity distribution in our galaxy; changing some assumptions could result in an enhanced event rate in a germaniun detector as compared to a xenon detector. For all these reasons, the Xenon100 exclusion was not considered conclusive. Now the situation is clarified when the CDMS collaboration has recycled their old data so as to improve sensitivity for light dark matter. They lowered their recoil energy threshold down to 2 keV (as compared to 10 keV in their previous analysis). Lowering the threshold comes with the price, as at such low recoil CDMS cannot use the phonon timing cuts to better differentiate nuclear recoils (expected from dark matter scattering events) from electron recoils produced by all sorts of pesky backgrounds. The discriminating variable that remains available is the ionization yield (nuclear recoils typically produce small ionization, in a well-defined band) but that is not enough to get rid all of the events, see the plot above. Thus, whereas previous CDMS searches were expecting less than 1 background event, the new analysis has to deal with hundreds. Still, the dark matter cross section on nucleons that would be consistent with the CoGeNT signal would produce many more events than CDMS has observed. 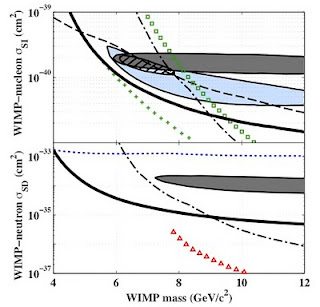 Assuming that all observed events come from dark matter (this is very conservative, as they are able to assign these events to known sources, such as surface events or noise) allows them to set pretty tight limits on the cross section in the low mass, see the solid black line in the upper plot. The CoGeNT region (shaded blue) is now comfortably excluded. CDMS uses the the same germanium target as CoGeNT, so even theorists may find it hard to come with an explanation how dark matter could produce a signal in one and not in the other. Therefore it seems safe to pronounce the CoGeNT signal dead. Too bad. However the dark matter detection business regularly produces new entertainment; maybe the much-expected soon-to-come one-year Xenon100 results will provide us some?